Do you know – or are you yourself – an aviation enthusiast? If so he – or she, or you! — you might be interested in the recent book B-24 Liberator In RAF Coastal Command Service With Focus On Aircraft Of No 311 (Czechoslovak) Squadron RAF. This highly detailed book of 316 pages examines the role undertaken by the B-24 Liberator equipped units of Coastal Command during the Second World War, with emphasis on the activities of 311 (Czechoslovak) Squadron. This extensive study includes overviews of the versions of the Liberator used by RAF Coastal Command and of the RAF Squadrons using it in maritime service, and a complete list and operational history of all 81 Liberators used by No. 311 (Czechoslovak) Squadron in Coastal Command service during WW2 and afterwards. Hardback, the book contains 550 photos and 70 colour profiles. It is written by Pavel Türk and Miloslav Pajer. 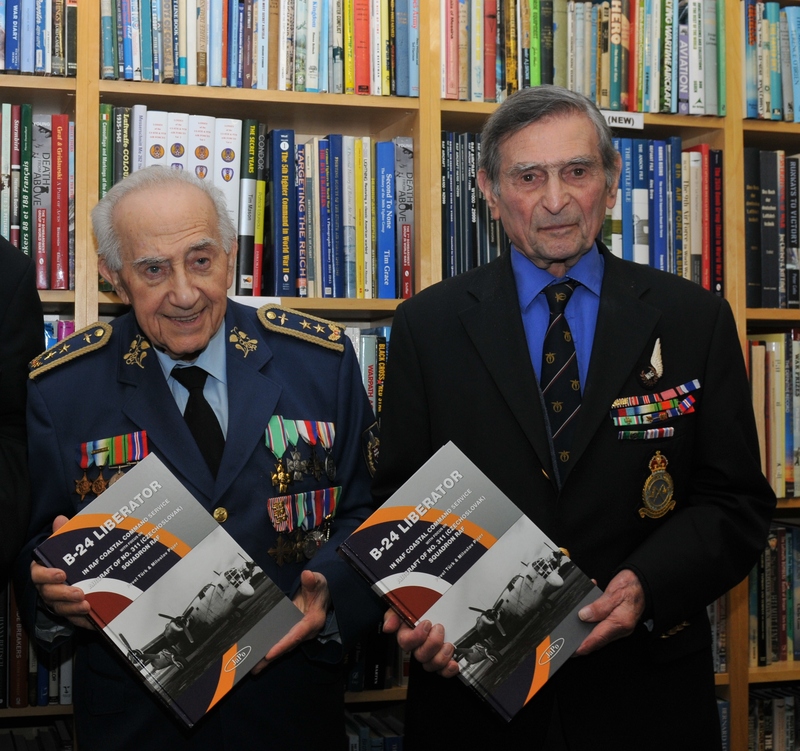 It was launched at the Aviation Bookshop in Tunbridge Wells, in the presence of two RAF Coastal Command veterans, Ivan Schwarz and Arnost Polak, and the author Pavel Türk. It is published in the Czech Republic by JaPo, costs £59.99, and is available from the Aviation Bookshop, 31-33 Vale Road, Tunbridge Wells, TN1 1BS (01892 539284 and www.aviation-bookshop.com). Our thanks to the Aviation Bookshop for use of the photo of the veterans. A different group of Tunbridge Wells Writers have just released a book – Something in the Water, Unreliable Biographies – which showcases their fiction. They will be at the Tunbridge Wells branch of Waterstones at 7 pm on Wednesday September 9th to talk about it and will be reading extracts. Tickets are £3, but can be redeemed against the price of the book. Ring 01892-535446 to book a place. In Waterstone’s today I spotted a book (in the fiction section) entitled Working On My Novel by Cory Arcangel. Wonderful name. An irresistible, to me, title. However, when I leafed through it, the book was almost non-existent. Lots of white space, interspersed with a short quote per page – from the writer and others – about the difficulty of putting pen to paper. I might have been tempted to spend £1.99 on it, but never £5.99. I guess Penguin were seduced by the fact that these are quotes from this guy’s twitter feed and that he has lots of followers. He is a Brooklyn-based post-conceptual artist working in all kinds of media, including music and video game modification. He does not appear to be actually working on a novel, but I could be wrong. In which case, my apologies to him. An obituary caught my eye recently: Author who…finished Jane Austen’s last novel. Sanditon! The book Jane Austen was writing just before her death, and which was completed so delightfully forty years ago by ‘Another Lady’. Marie Dobbs, originally from Australia, used the pseudonym ‘Another Lady’ because the early Jane Austen novels were attributed to ‘A Lady’. My copy of her completed Sanditon is as dog-eared as any of my other Jane Austen paperbacks; Marie Dobbs had a remarkable ability to capture something of Jane Austen’s irony and wit. It has to be said that this isn’t true of most other Jane Austen completions and spin-offs. The break is practically seamless, coming in chapter eleven, after a splendid Jane Austen sentence: Poor Mr Hollis! It was impossible not to feel him hardly used: to be obliged to stand back in his own house and see the best place by the fire constantly occupied by Sir Henry Denham. Sanditon’s heroine Charlotte is rather like Elinor in Sense and Sensibility, but more impressionable; Jane Austen describes how she is initially attracted by the flattery of Sir Edward: I make no apologies for my heroine’s vanity. If there are young ladies in the world at her time of life more dull of fancy and more careless of pleasing, I know them not and never wish to know them. Sidney Parker, whose character is entirely filled in by Marie Dobbs, (he makes his first appearance only a page before Jane Austen leaves off, but a typical Jane Austen clue earlier in the novel marks him out as the intended hero) is as fun-loving and attractive as Henry Tilney in Northanger Abbey. Every neighbourhood should have a great lady, wrote Jane Austen at the beginning of chapter three, and Lady Denham is as monstrous as Lady Catherine in Pride and Prejudice while Sir Edward develops nicely into the role of self-deluded seducer and the ghastly Miss Beauforts make perfect targets for delicious Austen-like sarcasm. So what was there left to worry about in completing Jane Austen’s last manuscript? Only the way she wrote it… for deficiencies in this seventh novel I do apologise. Marie Dobbs in the afterword to her completed Sandition had no need to apologise; her work will continue to bring endless pleasure to all of us who can’t get enough of Jane Austen. I only wish I had known before now who ‘Another Lady’ was, and written to thank her. The September edition of Good Housekeeping features the publication of The Daughter’s Secret by Eva Holland – the novel which won their Good Housekeeping Novel Competition last year. Eva beat over 3,000 entrants to scoop a £25,000 prize and gain a hook-up with agent Luigi Bonomi. Good Housekeeping’s next competition will be launched in 2016, but to give aspiring novelists a head start they will be holding a publishing masterclass on September 23 at their headquarters in London. It costs £20 (including a glass of wine!) and will be hosted by Luigi Bonomi, Kate Mosse and Eva Holland. At least that is supposed to be the website. Persevere and you should get there eventually! Recently ninevoices entered half a dozen stories into a competition. They were good stories – at least we thought so – so we waited hopefully for the outcome. Might we sweep the board? There were three monetary prizes on offer, plus the consolation possibility of getting on their short list. Reader, we bombed. No prizes. No shortlisting. Nada. Yet the standard of writing was high. Some of ninevoices have won prizes and been published in the past, so we know we’re not totally hopeless. We just were’t offering what the judges were looking for on this occasion. HOWEVER, the great thing about being in a writing group is that you aren’t allowed to even think of giving up. There are other competitions out there and we will be entering them. Watch this space. With apologies for this having somehow gone missing yesterday. Please remember to double-check details on the appropriate website in case of any errors on the part of ninevoices. We wouldn’t want you to miss a deadline or get the entry details wrong. You know how it is – you fire up the computer to rush something out (in my case, so that I could watch today’s Test cricket replay) only to find you didn’t complete the task properly. Having listed competitions with August deadlines, I somehow idiotically deleted the post. My apologies. I will re-list them really SOON. Manchester Fiction and Poetry Prize – Correction!